We provide multiple pathology services and tests on-site for your convenience! All our doctors provide Pap Testing (Papsmears). However, our practice nurse, Kim, is also an accredited Pap Test Provider. 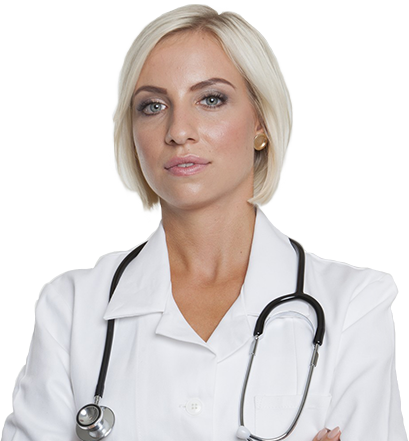 She is very gentle and also provides breast and sexual health checks as well. Iron deficiency is very common from various causes. If it is severe, it may cause significant tiredness and dizziness due to iron deficiency anaemia. Taking oral iron tablets or/and injections may cause many undesirable side effect and is often poorly effective. Iron infusions are considered much more effective and rapid. They can be given intravenously in the hospital over many hours. However, a new product of comparable effectiveness and safety, called Ferinject (Ferric Carboxymaltose), is now available and can be infused through a drip intravenously over 15 minutes (or less depending on the dosage required) in our medical clinic. Patients will then need to be observed for 30 minutes afterwards. These are suitable for patients with iron deficiency anaemia above 13 years old only. ECG is a medical device that can detect many heart abnormalities by measuring the electrical activity generated by the heart. Unlike simple ECGs, 12-Lead ECGs provide the most accurate and highest quality recording. Our doctors and nurses are adept at performing and reading ECGs. Allergies like hay fever and eczema are very common and disruptive. 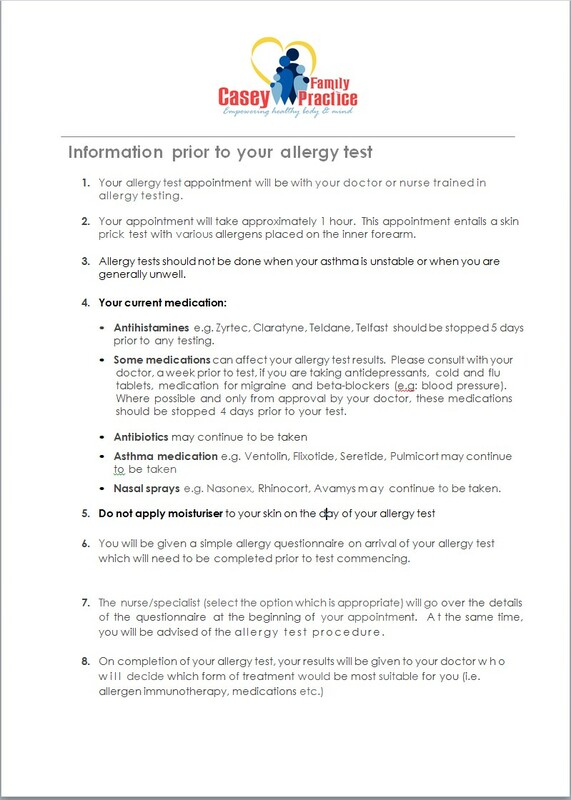 One way to help determine what causes your allergy is to do a skin allergy test. It is a simple test where we prick the skin of your forearm with eight common allergens. Management for people with severe allergies include avoidance and preventative strategies, as well as immunotherapy. Immunotherapy can be given by injections or, more recently, through oral medication, depending on the offending allergen. Certain medications, like antihistamines, must NOT be taken before the test. Some people are also not suitable for the test (e.g. have had anaphylaxis). We charge a small fee of $40 (other providers charge over $150) for this service as Medicare does not provide a rebate for it. Please ensure the device does not get wet and is returned to our clinic the following day for data analysis. 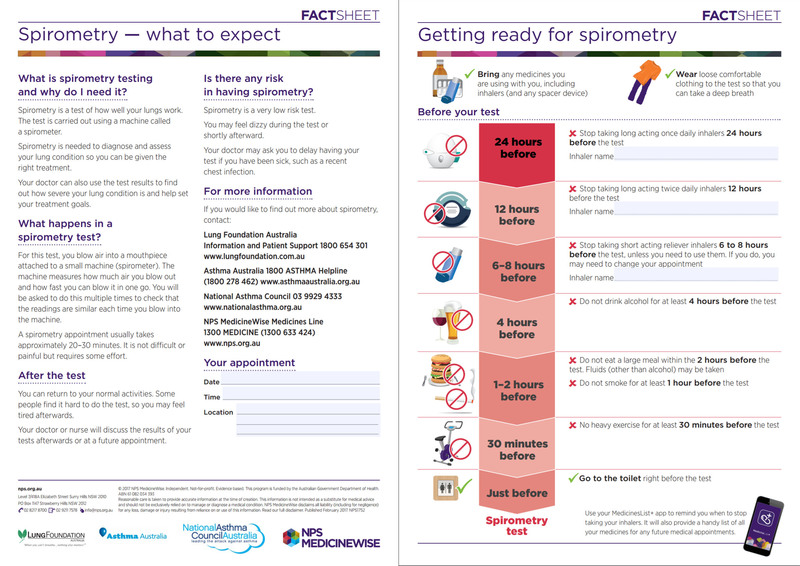 This test is very accurate and is used to diagnose asthma, COAD, and a number of lung diseases. It is very important that the test is done correctly. If you are on long acting inhalers (e.g. Seretide, Spririva, Serevent), then you should continue using these unless requested to stop by your doctor. Please do not undertake if you are afflicted with a cough or cold. We charge a small fee of $50 for this service. Please ensure the device is returned to our clinic the following day for data analysis by a Cardiologist.